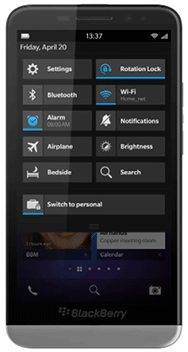 BlackBerry mobiles design for professionals.BlackBerry introduced many smart-phones like Touch phones, Keyboard Phones, Touch and Smart together, Moreover The BlackBerry Z30 smartphone has a 5-inch Super Amoled display and runs on a 1.7 GHz processor with quad-core graphics that makes browsing web pages faster and games more detail. The Z30 also comes with stereo speakers and new antenna technology that dynamically tunes reception to provide better connectivity in low-signal areas. "iPhone and Android users will gain access to mobile giant BlackBerry's popular messaging service (BBM) BlackBerry Messenger for the first time.BBM has always been one of the most engaging services for BlackBerry customers."